New Orleans History – All Souls Day and above ground cemeteries in New Orleans in celebration of Halloween! Ghosts and ghouls and goblins! All Hallows’ Eve is upon us! New Orleans never lacks for an excuse to party. Halloween provides a fun theme. Even in New Orleans, the season offers more than jack-o-lanterns, black cats, and witches on broomsticks. On Halloween, Catholics gear up for the really important day: The Feast of All Souls, on November 2. Halloween wasn’t really A Thing in New Orleans until the 1980s. Anne Rice’s first novel of her “Vampire Chronicles” dropped in 1976. The series enticed people. Readers accepted the notion of vampires in New Orleans. Combine this with other authors like Poppy Z. Brite (Billy Martin), writing about paranormal New Orleans. It was as if we always had vampires. Add The Witching Hour and Rice’s other “Mayfair Witches” stories. Halloween and New Orleans connected. Voudon doesn’t have a lot of connection to Samhain or All Hallows Eve. St. John’s Eve, at midsummer, was always the big “feast day” for followers of Voudon. While the focus should be on the Celtic traditions, Voudon gets caught in the mix. The annual Voodoo Music Fest contributes to this, much to the dismay of those who don’t approve of the mashup. The Catholic Church recognizes individuals believed to be in heaven as saints. (New Orleans recognizes football players wearing black and gold as Saints). While conclusive evidence of such a state is hard to come by, Catholics make it happen. So the Church looks for supernatural events after a person’s death. Those taking up the “cause” of a prospective Saint attribute “miracles” to them. A sick person prays to a holy person for intercession. Their illness passes. The Church calls that a miracle. So, the Pope declares the holy person a saint. Martyrs, those who give their lives defending their faith, are believed to go immediately to heaven, which is why the yearly calendar of saints’ feast days includes a large number of them. In fact, the first recorded general recognition of saints was in 609, when Pope Boniface IV consecrated the Pantheon in Rome for the Blessed Virgin and all martyrs. May 13 was designated the date this event would be commemorated. During the papacy of Gregory III (731-741), the recognition of “all saints” was moved from May 13 to November 1. This commemoration gave the Church a “catch-all” day, where folks could pray for their “personal saints,” family and friends who they believed were in heaven but would never be formally recognized by the Church as such. The tradition of All Hallows (All Saints) is a strong one, but it’s still secondary in New Orleans. Faithful Catholics rise and go to Mass on November 1st. So, then they head out to the cemeteries. They clean up and prepare their family tombs for November 2nd. That’s the “Commemoration of all the Faithful Departed.” Catholics call the day, the Feast of All Souls. While most people don’t want to believe that Grandpa is burning in the fiery pit for all eternity, maybe he wasn’t as good a person as he could have been. Catholics have a solution for that situation: Purgatory. The idea was, since Grandpa wasn’t ready to go directly to heaven, he had to make a stop along the way, for purification. This pit stop was worked up over centuries into an elaborate system, where the faithful could pray for a “reduction in sentence” as it were, for their loved ones that were in Purgatory. Knowing that Grandpa wasn’t on the express train motivated Grandma to make sure the family tomb was kept up well and prayers regularly said for the repose of his soul. Since November 2 was a work day (the day before often is a holiday in Catholic-dominated countries), any clean-up projects at the cemetery had to be done on the day before. Cleaning up the family plot is often a bit more complicated in New Orleans than other parts of the United States, because we regularly bury our loved ones above-ground. The New Orleans cemetery tour guides will tell stories of how this had to be done in the early years of the city, since burying coffins below sea level would force them to the surface as the water table would rise. The truth of the tradition is a bit more simple (and obvious): above-ground burial was something that came over to New Orleans from France. Above-ground tombs gave families a better focal point for visiting the departed and praying for a remission of their time in Purgatory. These tombs are usually made of regular brick-and-mortar, then plastered over and whitewashed. Catholic cemeteries in New Orleans were usually constructed by the various ethnic groups that made up the city’s faithful. The French-Spanish-African Creoles had the original St. Louis cemeteries in Faubourg Treme and Faubourg St. John. The Irish built the St. Patrick’s cemeteries at the head of Canal Street, and the Germans had their cemeteries dedicated to St. Joseph on Washington Avenue. The heat and humidity of the city’s climate takes its toll on those structures. They require periodic maintenance. Families share tombs. They also share the maintenance duties. So, the adult children go out to the cemetery with Grandma on All Saints Day. The kids come along, of course. So the scene in the cemeteries was often quite festive. Everyone spruced up their tomb. What started as work details became picnics where families that grew apart would come together for a very worthy cause. Siblings and cousins could catch up with each other, and Grandma was able to go to the cemetery regularly for another year with her head held high. Happy Halloween, Blessed Samhain, All Saints and All Souls! St. Augustine Catholic Church in the Treme – Podcast! St. Augustine Catholic Church – Podcast! NOLA History Guy Podcast this week is a “snippet” – a short presentation on an illustration from Emma Fick’s book, Snippets of New Orleans. So, we chose Emma’s illustration of St. Augustine Catholic Church for this week While there are three “St. Augustines” in New Orleans, this is the oldest. Bishop Blanc dedicated St. Augustine Catholic Church October 9, 1842. Therefore, it is to this day, the spiritual nexus for Creoles of Color who are Catholic. These Creoles of Color bought lots in Treme and built homes. By the 1830s, their numbers were large enough that they went to then-Bishop (later Archbishop) Antoine Blanc, and petitioned him to create a Catholic parish for their neighborhood. Bishop Blanc agreed. Therefore, the community began work to raise money and build their own church, so they didn’t have to walk down to St. Louis Cathedral to go to Mass. The neighborhood built their church on land donated by the Ursuline Sisters. So, the nuns asked that the church be named in honor of St. Augustine of Hippo, one of their order’s patrons. You can buy Emma’s wonderful book at all of the usual suspects, including Octavia Books. NOLA History Guy Podcast is sponsored this week by Elysian Fields Press, publishers of Edward J. Branley’s latest novel, Trusted Talents. Good Friday is still a day off for many businesses in New Orleans. Like many local traditions, those surrounding Holy Week have become blurred as our world becomes more secular. Our grandmothers and great-grandmothers focused on religion so much more. Grandma and Great-Grandma took Holy Thursday and Good Friday much more seriously. They build up to the big celebration of the Resurrection. So, on Wednesday, kids dash out of school in the afternoo. They anticipate a break that runs at a minimum to the following Tuesday. Some schools take all of the following week off. Either way, the family’s home on Thursday, and that’s important, because there was work to be done. Momma had to make sure the family had clothes ready for not only the Big Day, Easter, but for Mass Thursday night and Friday’s religious activities. Food was also a big issue on Holy Thursday, because everyone was going to be at the big Mass that evening. Friday involved the Nine Sisters, so that meant there wouldn’t be much time for cooking then, either. The first big liturgical event since Palm Sunday is Mass on Holy Thursday. It’s usually one big parish event, featuring the “washing of the feet”. While every celebration of the Eucharist is a remembrance of the Last Supper, this is the one that syncs with the calendar. As a kid growing up in the late-sixties/early-seventies, the one thing about Holy Thursday’s Mass that always struck me were the “smells and bells”. This was the time when the instructions from the Second Vatican Council were starting to kick in full-on, and two big themes that stood out in the mind of a fifth-grade altar boy were the transition of the liturgy from Latin to English, and the toning down of the various ceremonies. Even in parishes that had pastors totally committed to Vatican II, Holy Thursday and Easter Sunday were “High Mass” days, complete with the choir, the good vestments, incense, and ritual. The choir worked overtime on Holy Thursday, singing before Mass, leading the congregation in singing the responses during Mass itself, then singing while the church was “stripped” of all the linens, and the statues were covered for Good Friday observances. Once the church was stripped, we reached the part in the script where bad things happen, so the choir ended, and everyone went home. Good Friday is the most solemn day in the liturgical year. Observing the death of Jesus meant quiet time for the kids in many devout households. It also meant unsupervised time, as the men and women of the neighobrhood either observed Good Friday at the parish church, by pitching in to do clean-up work, or even just kneel in prayer for a large part of the day. In Uptown New Orleans, Good Friday meant walking the Nine Sisters. Visiting nine churches on Good Friday is a French-Spanish tradition that can be traced back to the Spanish Colonial period. Given the distance covered in the traditional Uptown-to-Downtown walk, the tradition was either also observed in Germany, or the Germans and the Irish picked up on it from the Creoles of the city. Why nine churches? There’s a lot of speculation on that one. The closest thing to a nine that ties with Holy Week is that there are nine days from Jesus’ Ascension into Heaven and the coming of the Holy Spirit on Pentecost. Of course, these events happen weeks after Good Friday, but let’s not quibble. In modern times, the list of nine churches has been expanded to fourteen, a more-logical number, since there are fourteen Stations of the Cross. The route of the Nine Sisters: Start at St. Stephen’s on Napoleon Avenue, Walk around the corner to St. Henry’s, on Berlin Street (Now General Pershing St.) From there, walk to Our Lady of Good Counsel, on Louisiana Avenue at Chestnut Street. Since the post-Katrina consolidations of parishes done by the archdiocese, all three of these churches are part of the same parish, under the same pastoral management. The seat of the parish is St. Stephen’s, but they open the other two until noon for Good Friday devotions. The next church has varied over the years. Most likely, it was Notre Dame de Bon Secours (Our Lady of Prompt Succor), the “French” church of the three churches that made up the “Redemptorist parish” that serviced the Garden District and the Irish Channel. 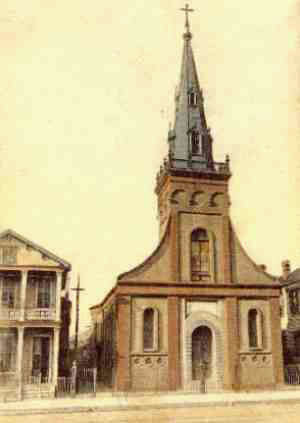 After that church burned down in the 19th Century, the faithful most likely stopped at the chapel at the residence of the Redemptorists, on Prytania and Third Streets. Nowadays, the Redemptorists are gone from New Orleans. The order sold their Third Street residence to Anne Rice, who told the Catholics of the Garden District to go down to St. Mary’s Assumption, on Constance and Josephine Streets, in Da Channel. The wealthy folk of the Garden District opted to resurrect the old Notre Dame church, in an interesting way. When the church we know as St. Mary’s Assumption was constructed in the 1850s, the Germans dismantled the wooden church that was on that corner, moving it to St. Joseph Cemetery, on Washington Avenue and LaSalle Street. It stayed there for 150 years, serving as a mortuary chapel. That chapel was moved to Jackson Avenue, so now it becomes the Fourth Sister, in the 1500 block of Jackson Avenue. From St. Mary’s Chapel, the path turns towards the river, and the faithful stop next at St. Alphonsus. St. Alphonsus is the “Irish church” of the Redemptorist parish. After performing their Veneration of the Cross at St. Alphonsus, the next Sister is directly across the street, St. Mary’s Assumption. After stopping in at the “German church”, it’s a ten-block walk to the Seventh Sister, St. Theresa of Avila, on Erato Street, in the Lower Garden District. From there, the second-to-last stop is the other Irish parish, St. Patrick’s on Camp Street, in the Warehouse District. From there, the trek ends at the Church of the Immaculate Conception, better known as “Jesuits’ Church” on Baronne Street in the CBD. Then followed the walk back to Jefferson City or Faubourg Bouligny. It’s only logical that momma wouldn’t want to cook a lot of food on Good Friday. After all, that walk from Napoleon Avenue to Canal and Baronne in town is a big effort. Even if you take the streetcar back, a big chunk of your day is used up. No time to cook! That’s never been too big a challenge for Creoles and Yats, though. Momma knows how to prepare ahead. No, the big challenge for Holy Week is the dietary restrictions that used to be enofrced by the Church on Good Friday. Even a lot of good Catholics forget that Lent was much tougher on the faithful than it is now. Lent wasn’t merely a time of paryer and reflection, but also a time of fasting. In this context, “fasting” usually meant having only one meal a day. Coffee and a piece of toast for breakfast, followed by a light lunch, like a hard boiled egg, or maybe a Mrs. Drake’s chicken salad sandwich. Over time, those restrictions were eased; fasting was cut back to just Ash Wednesday and Good Friday. Good Friday – Fast and abstinence! But back in momma’s day, it was fast and abstinence on Good Friday. That meant not only one meal, but no meat! For Catholics in New Orleans, that wasn’t hard to deal with, just eat seafood. Fish, shrimp, oysters, the possibilities were endless. But, for many of the faithful, substituting fried shrimp or oysters for chicken or pork just wasn’t good enough. There was no sacrifice. Additionally, seafood wasn’t as ubiquitous or inexpensive fifty years ago as it was now. Some folks just couldn’t afford to have a shrimp fry. The common New Orleans solution to the problem of keeping costs down was to make dishes that stretched the resources, like jambalaya, gumbo, red beans that taste like ham because of the bone, but didn’t have any real meat in them. Momma was creative, like her momma before her. But when it came to making a filling meal with no meat or no shellfish, momma knew what to do. Greens. Herbs. Spices. Momma knew from her Creole ancestors how to make a roux, then combine the green stuff to make Gumbo z’Herbes. The meatless version of our classic thick soup was just the right meal for Good Friday. It’s gumbo, so it’s easy to prepare ahead of time. Momma could put the proper time in to make a roux and let the soup simmer, then put it aside overnight. When she came home from making the Nine Sisters the next day, all she had to do was put the pot back on the fire and heat things up. Judy Walker gives us the recipes for two versions of this wonderful soup in her NOLA.com column. Gumbo is a filling soup. A good roux of fat and flour, thinned down with water or stock, could be a meal in itself. Add in a lot of green goodness (Chef Leah at Dookey Chase says there are nine different kinds of greens in her gumbo), and you get an even more filling dish. Even when we try to sacrifice, we just can’t make it happen. Gumbo z’Herbes is the closest thing to the “bread of affliction” we’ve got in New Orleans. Meat in your Gumbo z’Herbes! 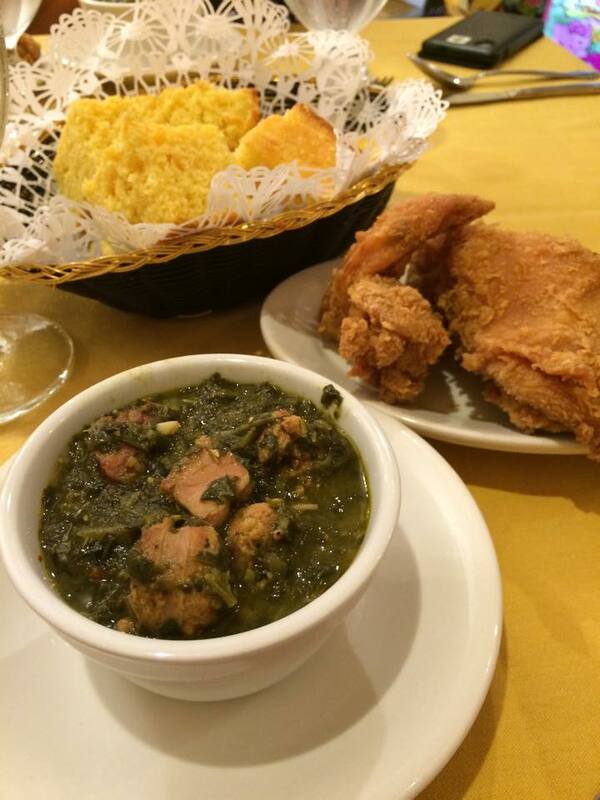 When you go to see Chef Leah Chase at her restaurant on Holy Thursday, you get Gumbo z’Herbes and Fried Chicken. Her gumbo is different from the traditional, meatless dish. Why? That should be obvious. She’s not serving it on Good Friday, and the meat she adds makes the soup taste wonderful. But wait, you say, Ms. Leah has sausage and chicken in her Gumbo z’Herbes! Yes, that’s correct. That’s because she’s serving it on Holy Thursday, when there’s no restriction on meat. Some cooks, when making Gumbo z’Herbes for Good Friday would make extra gumbo base (roux, water, basic stock vegetables) and then whip up a chicken-and-sausage gumbo for dinner on Thursday. If momma was particularly busy, she’s just make extra Gumbo z’Herbes, adding the meat. The irony of gumbo during Holy Week is that it’s a wonderful food that doesn’t distract from the important devotional activities. It’s why folks from everywhere else just don’t understand us.